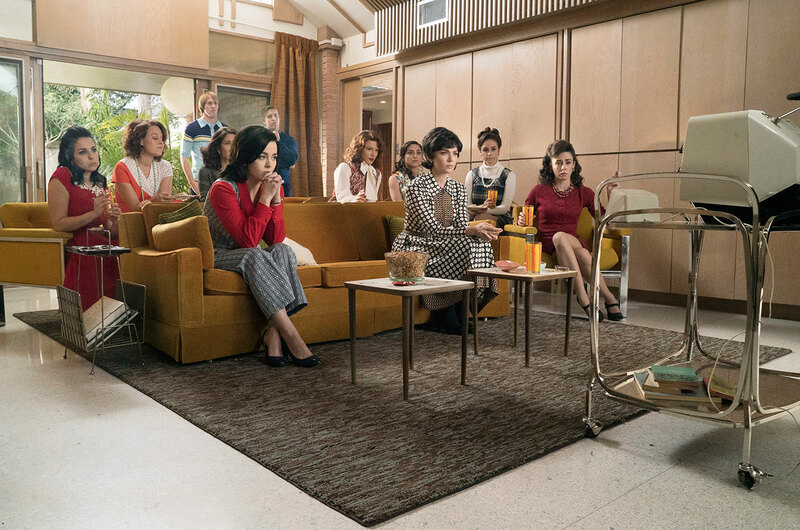 — The penultimate episode of ABC's "The Astronaut Wives Club" explored "The Dark Side" of being a spaceman's spouse, as the ninth hour was titled. The 10-part docudrama's second-to-last installment, which aired Thursday (Aug. 13), focused on the wives' fears and struggles with losing their loved ones — whether it was to divorce, surgery, war or to an in-space accident. "Wally's career at NASA ends, and Jo must redefine her role and priorities. Louise wrestles with the fear of losing her husband as Alan considers undergoing risky surgery that will determine his future. Susan Borman grapples with uncertainty as the Apollo 8 mission goes where no man has been before," ABC's wrote in its synopsis. The episode was set in the tumultuous year of 1968, and included the flights of Apollo 7 and Apollo 8, the latter the first mission to send humans to circle the moon. Post-mission debriefing: Here's a look at where "The Dark Side" illuminated real space history ("A-OK!") and where it veered off course ("ABORT!"). 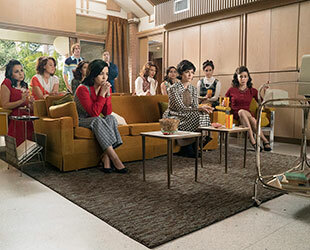 As the episode begins, the wives are watching presidential candidate Robert F. Kennedy (portrayed by William McNamara) deliver a campaign speech on TV while trying to spot Rene Carpenter and Annie Glenn (Yvonne Strahovski and Azure Parsons) among the crowd. A-OK! ...and ABORT! Both John and Annie Glenn, along with Rene, joined Kennedy's campaign, with John making speeches for the senator, building off the relationship that began with the astronaut's first run for Congress. Later in the episode however, Rene and Annie are shown on the stage on June 5, 1968, as Kennedy claims victory in the California primary and leaves to greet kitchen workers at the Ambassador Hotel in Los Angeles where he was shot. In reality, Rene was absent that morning and John and Annie Glenn were watching the speech on TV from their hotel room. The Glenns did fly with five of Kennedy's children back to their home and, with a neighbor, informed them of their father's death, as the show makes mention. Wally Schirra (Aaron McCusker) and Jo (Zoe Boyle) talk about how after he returns from commanding Apollo 7, he will retire from NASA. A-OK! Wally, who was the only astronaut to fly on Mercury, Gemini and Apollo, decided to resign from NASA before launching on the first flight of NASA's lunar program. "For one, I wanted to quit while I was ahead," wrote Schirra in his biography, "Schirra's Space," in 1988. "I also wanted to be clear that I was single-minded about the Apollo 7 mission." Apollo 8 commander Frank Borman (Jon Abrahams) tells Gordon Cooper (Bret Harrison) that he may have to settle for being the second man on the moon because "with everything going on overseas, they are worried about it looking like a military operation." ABORT! There was no way that Deke Slayton, who lead the assignments, or anyone else, could have directed that a civilian be the first man to walk on the moon (even though it turned out that way). Neil Armstrong, as Borman's back-up on Apollo 8, was inside mission control in December 1968 when Slayton approached him about commanding Apollo 11. But at that point, there was no way to know, let alone guarantee, if it would be the first mission to land men on the moon. For one thing, Apollo 8 through Apollo 10 had to all be successful and if the end-of-the-decade deadline grew too tight, the landing could have been moved back to Apollo 10. And if something went wrong on any of the interim missions, or on board Apollo 11, the first landing could slip to a later flight. Coming to see her husband at work, Louise Shepard (Dominique McElligott) finds a sign hanging on Alan's office door. One side has a photo of Alan labeled, "The Icy Commander;" the other, "Smilin' Al." A-OK! Grounded as a result of Ménière's disease, Shepard's demeanor could swing from amenable to downright irascible. His secretary took to displaying one of the two pictures — smiling or scouring — to warn those heading into meetings. Deke Slayton (Kenneth Mitchell) becomes concerned that Donn and Harriet Eisele's (Ryan Doom and Elaine Carroll) crumbling marriage will blow up in the press and urges the two to settle their differences. A-OK! Slayton did intervene, even reaching out to Eisele's mistress (and later second wife), Susie, to not break off the affair, less it distract Eisele from the mission. Similarly, Eisele appealed to astronaut Tom Stafford's wife Faye to dissuade Harriet from beginning divorce proceedings before his launch. Harriet (with the support of her minister, not Marge Slayton) filed for divorce on March 10, 1969, and it hit the newswires the next day. 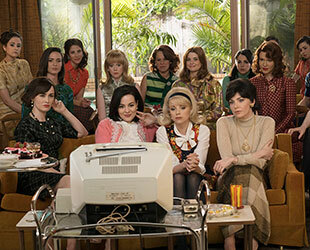 Unlike in the show, the Eiseles' split did not coincide with Apollo 8, but rather the first moon landing: the divorce was final on July 15, 1969, a day before Apollo 11 launched. Listening to the space-to-ground audio from Apollo 7, Jo Schirra and the other wives hear Wally complain from orbit about the timing of the planned first TV broadcast. A-OK! Even before Apollo 7 launched, Wally had objected to the TV broadcast being added to their mission, arguing that it didn't add to the technical or scientific goals of the flight. Further, he did have a cold, which he passed onto his two crewmates, and voiced his dismay that the ground controllers were not taking that into consideration. The episode indicates that the call about the first TV broadcast happened four hours into the flight, which is too early. Schirra's cold was first reported almost 15 hours into the mission, and the call to delay the TV broadcast didn't come until the end of the first day at 23 hours and 15 minutes. The show does get Schirra's quote correct: "I can tell you at this point the TV will be delayed without any further discussion until after the rendezvous." The first-ever live television broadcast from a U.S. crewed spacecraft ultimately began three days into Apollo 7 with the three astronauts displaying a sign, "From the lovely Apollo room high atop everything." "Dark side of the moon." Rene Carpenter takes to the anchor desk to provide commentary during the Apollo 8 mission. "The spacecraft will travel to the dark side of the moon..."
ABORT! ...and ABORT! Rene was indeed hired to offer on-air commentary during an Apollo mission, appearing on NBC, but it wasn't for the first flight to orbit the moon. Rather it was for Apollo 7. "Mrs. Carpenter will be with David Brinkley in our New York space center during the launch Oct. 11," an NBC spokesman noted in the fall of 1968. "Her assignment will be to help out with the discussion of what happens — give the woman's angle, or you could call it the wife's angle." Also, there is no such thing as the "dark side of the moon." While the far side of Earth's natural satellite remained dark — as in unknown — until probes and people flew above it, the far side receives the same amount of light as the near side. Consumed by the idea that her husband, Frank, will be lost during the Apollo 8 mission, Susan Borman (Antonia Bernath) drinks, confines herself to her bedroom, and even writes Frank's eulogy until she knows he has safely made it around the moon. A-OK! As recounted by historian Andrew Chaikin in "A Man on the Moon" (the basis for another series, HBO's "From the Earth to the Moon") while Susan Borman put on the airs of being calm and collected to the outside world, she increasingly feared Frank would die on Apollo 8. She even admonished flight director Chris Kraft. "If you think the fire was bad, wait until these guys get stranded in lunar orbit!" "She decided no government official would write her husband's eulogy; that was her job," Chaikin wrote. After weighing the risks and re-affirming her trust in her husband, Louise Shepard agrees with Alan that he should go forward with a surgery that could restore him to flight status. A-OK! (Sort of.) Shepard traveled to St. Vincent's Hospital in Los Angeles in 1968, and after checking in under the assumed Greek name "Victor Poulos" to protect his privacy, he underwent the surgery for Ménière's disease. Louise had initially raised concerns, but not as the episode depicted (hippies commune and all). "Despite her lifelong aversion to medical treatment and deep-seated belief in healing oneself through positive thought and prayer, the doctor's knife was the only possible answer," author Neal Thompson wrote in his biography of Alan Shepard, "Light This Candle," in 2004. "Do it, she said. Go for it." The Schirras leave Houston for Denver, Colorado. A-OK! Although the timeline is wrong (the Schirras moved in the summer of 1969), they did leave for Denver, where Wally became president of Regency Investors, a subsidiary of King Resources.